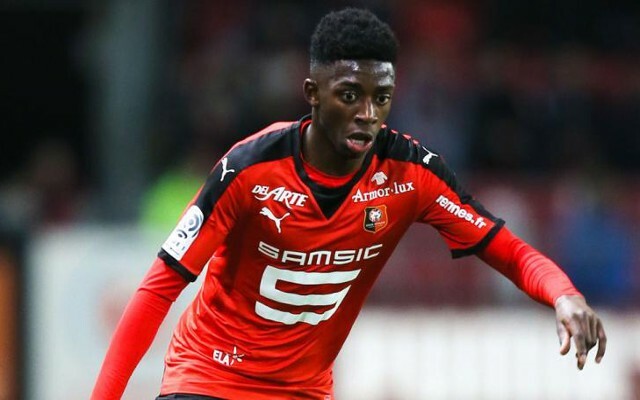 Stade Rennais striker Ousmane Dembele has revealed that he prefers Barcelona to Real Madrid—a comment that is sure to see speculation swirl about his future. The teenage frontman has emerged as one of Ligue 1’s hottest properties this season after an excellent campaign in which he’s made an explosive start to life in the top tier. Relatively unheard of before the campaign, Dembele has bagged 12 goals in 24 league outings to date for Rennes, helping the Breton side into the contention for a European berth. Beyond that, he’s also demonstrated both his creativity—setting up five assists for teammates—and his versatility. The 18-year-old is able to play on both flanks, and has also impressed in a slightly deeper No. 10 role as a second striker in support of another frontman. Particularly notable has been the forward’s explosive pace, although his intelligence has also been admirable for one so young. In a recent interview with beIN Sports, Dembele was forced to respond to transfer rumours linking with him to an imminent move to Paris Saint-Germain. However, while the forward admitted that the thought of a switch to the French capital could make “a lot of players dream,” he was keeping his feet on the ground and only focused on his immediate future with Rennes. Chelsea want £24m defender – Could he be John Terry’s replacement? Later in the interview, when answering quick-fire questions posed to him by the beIN reporter, Dembele admitted that, in a choice between Real Madrid and Barcelona, he would definitely plump for Barca.